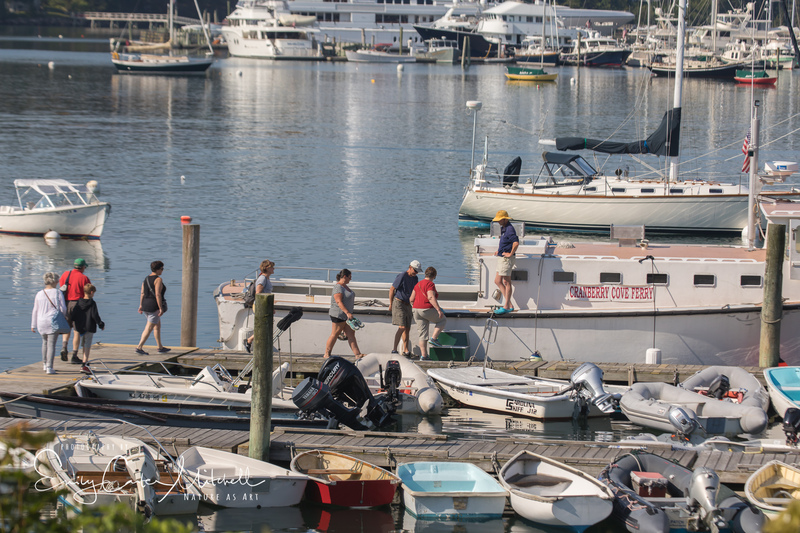 The coastal towns of Maine are dependent on life on the water. With many small islands dotted close to each other, the daily commute involves not a car but a boat. Traveling from Southwest Harbor the Cranberry Cove Ferry is one of the ways one can travel to and fro to the Cranberry Islands. Starting in the summer months at 7:00 a.m., each route takes nearly two hours to travel their full route. Beginning at Southwest Harbor, the next stop is Manset across the water before heading to Big Cranberry Island and finally turning around at Isleford Island. For the photographer on a budget that wants to enjoy the waterway, the 7:00 a.m. departure is nearly a private cruise on the waters and on a good day, great views of classic wooden boats, sail boats, and the mountains surrounding Southwest Harbor and Cranberry Cove can be enjoyed. Maine loves their boats and each one is well cared for and owned by those who have the financial means to maintain the woodwork. Many of these older boats are in the water for only a short while during the summer, then brought out of the water and housed in climate controlled boat houses during the off season. To say that having these boats restored and maintained are expensive is truly an understatement. The waterways are not just for the wealthy, in fact it is where all men are treated equally. Maine is known for Lobsters and Mount Desert Island is home to many lobstermen and women that work the water for their lively hood. Summertime is when the lobster run closer to the islands and the harbor is filled with buoys marking lobster pots deep in the water. Working for hours on end, starting at sunrise which is at 5:00 a.m., their day ends at the pier unloading their catch. Being on the water was a refreshing way to start the day and getting off the beaten tourist route allows you to meet locals to learn about their way of life. You sure “caught your catch” of nice boats! Thanks for sharing. Great shots. Looks like a wonderful place! I love the sea and truly believe I must have been a sailor in a previous life. Lovely images, Emily. Glad you enjoyed the experience; I would have too.